When you get your nose pierced, you're left with the adamant instructions not to touch it. Once you finally can, you'll probably want to change out the basic nose ring you were pierced with and replace it with the ring of your choice. 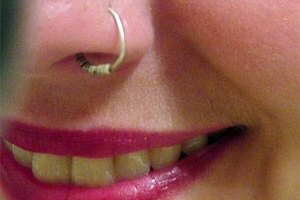 Many of the nose rings you can choose from are shaped like a hook, and as a result, they may be just a little more challenging than putting in your standard nose ring. Wash your hands thoroughly with soap and water. Your hands should always be clean when handling your piercing and jewelry. 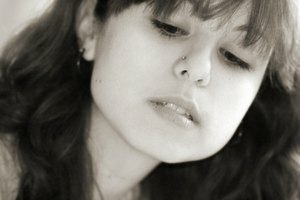 Cleanse both the hooked nose ring and your piercing with a lubricant or antimicrobial soap solution. Remove your current nose ring and place it off to the side. Insert your thumb into your nostril and press the flat side of it onto the piercing from the inside. This will help stretch the piercing hole so you can insert the new nose ring a little easier. Take the hook shaped nose ring and insert the bottom end into the hole on the outside of your nose. Twist the ring clockwise in a circle, gently screwing it in. Screw the ring into your nose until the end of the nose ring touches your thumb. Once you feel it, you can take your thumb out of your nose and the rest of the nose ring will slide in with a gentle push.